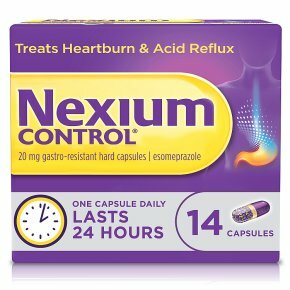 Take control of your heartburn with Nexium Control®. For 24 hour protection from heartburn and acid reflux. New innovative mini capsules: 53% smaller than the tablet. Comes in a portable bottle. Just one pill a day. For 24 hour protection. For zero heartburn. How to use Take one hard capsule once a day. Do not exceed this dose. The hard capsule should be swallowed whole with half a glass of water. Do not chew, crush or open the hard capsule. May take up to 2-3 days for full effect. If your symptoms worsen or do not improve after taking this medicine for 14 days in a row, contact your doctor. Read the package leaflet before use. Oral use. Do not use if you are allergic to esomeprazole or any of the ingredients of this medicine.<br>Talk to your pharmacist or doctor if:<br>You are taking any medicines listed in the package leaflet<br>You are over 55 and have new or recently changed reflux symptoms.<br>Keep out of the sight and reach of children.<br>Medicinal product not subject to medical prescription.